Free People crop bra (last seen here), Forever 21 polka dot palazzo pants (similar here), Prabal Gurung for Target wedge sandals, Spiked ladder necklace (we love this one too). 1. A view from the roof of our condo in Playa del Carmen. 2. Ready to explore the town in my boyfriend's Jcrew fedora (similar here), my neon tunic c/o Line and Dot, Chip and Pepper cut-off shorts, and American Eagle sandals. 3. Poolside in my new Marc by Marc Jacobs coverup and cat-eye sunglasses c/o BCBG Max Azria. 4. Hanging at our jungle beach house in Tulum in an H and M lace tank, Aritzia brocade shorts, sunglasses c/o Lookmatic (last seen here), and the AE sandals again. 5. 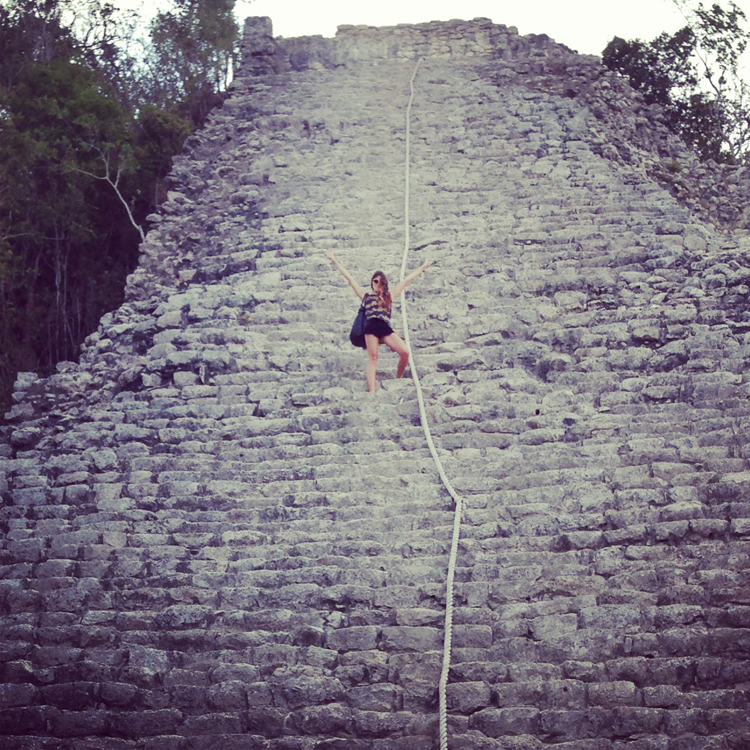 A victory selfie on top of the Nohoch Mul pyramid in Coba feat. 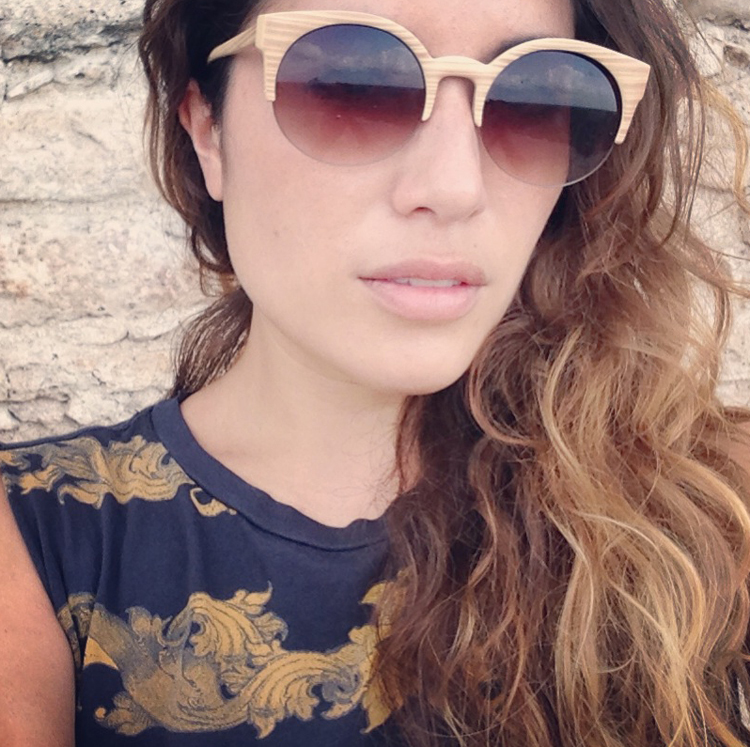 my new pair of Bershka shades purchased in Playa del Carmen. 6. Climbing down the pyramid in American Apparel cutoffs and a Zara baroque tee (also seen here). 7. Cooling off with a road soda in my Bershka shades, AE sandals, Chip and Pepper cut-offs, and a thrifted crop top. Looks like an incredible vacation! I, like Micol, am incredibly envious of your beautiful trip. I adore this post! Your patterned shorts are awesome! Lovely pictures! I really like the Marc Jacobs cover up. Glad you had a great time. Amazing place. Love these pics. Gorgeous pics ! loving those pants. Lovely pics; very beautiful sunset in the first pic. Your photos are absolutely amazing, a fantastic combination of location and style! Wow you look gorgeous in every photo! Looks like an amazing trip! Gorgeous looks! :) thanks for the comment! Perfect beachy casaul vacation looks. I need more of that in my life, for sure. Or maybe I just need a vacation! hey :) I nominated you for the versatile blogger award :) you can see the post here: http://prettylildolls.blogspot.ca/2013/04/versatile-blogger-award.html :) love your blog! LOVE the way these shots are taken, so lovely! I love Mexico, and you look amazing, wish I had those legs of yours! These photos are making me so jealous! These photos are amazing! It looks like you had an amazing time! Beautiful pictures and great outfits!